ZIMBABWE – WASHINGTON DC—President Robert Mugabe recent trip to New York to attend the United Nations’ 70th General Assembly has reignited debate over the millions of dollars spent on such foreign trips by the president and his huge entourage. Though some people told Studio 7 they had no issue with Mr. Mugabe attending the UN General Assembly as head of state, some analysts say it is the excesses that have become synonymous to the annual New York visit that have had some people talking. President Mugabe, who’s on the United States sanctions list barring him from traveling to the country, only visits New York once a year during the general assembly. In the process he brings a huge entourage that analysts say is an unnecessary cost, especially with the country’s economy in the doldrums. Former Finance Minister, Tendai Biti, says September, the month when the general assembly is held, has become an annual shopping jaunt for Mr. Mugabe and his entourage that normally includes his wife, Grace, several government ministers, close associates and state media journalists. Biti, who was finance minister in the government of national unity, says the issue is not about the one trip to the UN but the disproportionate amount of resources that are put in travelling. Although Studio 7 could not establish the actual number of delegates accompanying Mr. Mugabe this time around, sources close to the delegation say this year he had slightly less than 50 people, showing he has scaled down but not enough for many. The delegates, according to the sources, received 12,000 dollars in allowances for the one week they were in New York. Information Minister Chris Mushohwe could not be reached for comment to clarify the figures. However, Zanu PF Central Committee member, David Ndlovu says the trips are necessary because Mr. Mugabe is not only president of Zimbabwe but also African Union chairman. “If he does not fulfil those duties again people will complain and say he is not performing his duties,” said Ndlovu. Another former government minister, Moses Mzila Ndlovu, who was Foreign Affairs Minister in the Unity government, tells Studio Seven the problem with Mr. Mugabe’s trips is that they are not audited or monitored by the ministry. “Although under normal circumstances the Foreign Affairs is supposed to be responsible for the trips with Mugabe that is not the case because no one is supposed to question him,” said Mzila Ndlovu adding that even the current minister could be facing similar resistance from Mugabe. Biti agrees with Mzila Ndlovu, adding during his time at the finance ministry he would haggle with the president until money for the trips was reduced. 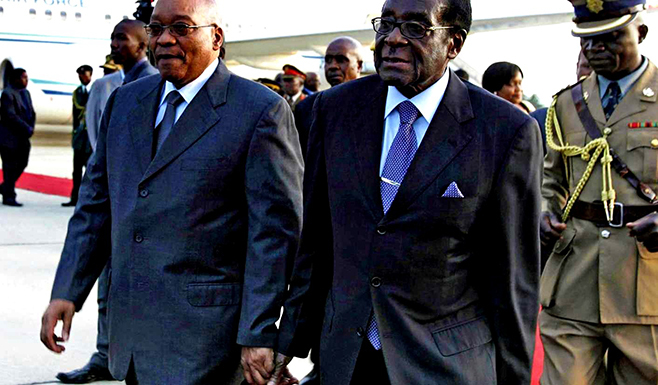 “The issue is not about only this particular trip … Mugabe has so far this year made over 40 trips,” he said. Mugabe’s travel itinerary was this year doubled following his dual role as chairman of the Southern African Development Community and the continental block, the African Union, that saw him travel to more than 25 countries within the first six months of the year. While some of the trips were paid for by the African Union, critics say Zimbabwe spent millions on his foreign travel that could have been used elsewhere.